Cleansing Conditioner for Medium Hair is rated 3.6 out of 5 by 23. 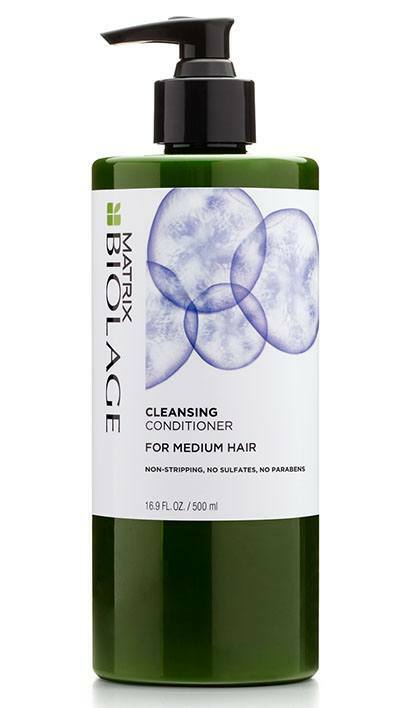 Share https://www.matrix.com/biolage/cleansing-conditioner/cleansing-conditioner-for-medium-hair Cleansing Conditioner for Medium Hairhttps://www.matrix.com/~/media/images/haircare/biolage/cleansing conditioners/2018/biolage_cleansing_conditioner_medium.jpg Helps prevent dryness and preserves softness and shine. Low-lather Cleansing Conditioners for medium hair with Acai provides thorough cleansing and targeted conditioning to restore suppleness, shine and bounce for optimum anti-frizz control. Suitable for daily use or in between traditional shampooing. Rated 5 out of 5 by Monic from Great producto amaizing for my Hair I love this product, my bear is beautyfull now, has all shine. Rated 5 out of 5 by Ginny Gin Gin from Great for my hair I've just finishing my first bottle of Biolage Conditioning Cleanser for Medium Hair and love the stuff. I have white/grey hair with great volume but it's not very thick. I like this product because you don't have to use conditioner, which can make my hair a bit heavy. I also use the leave in conditioner every now and again and love that as well. Rated 1 out of 5 by OkieGymnasticsMom from Horrible I would not recommend! I bought this product about a month ago when it was recommended at a salon after I had gotten new fashion color put into my hair. This first time I used it my hair got extremely greasy and I thought I had used too much. The second time I used half the amount and It did the same thing. And so I called the place and double checked the instructions for use to make sure I was using it correctly. I decided to try and use it a last few times before buying new shampoo and the final 2 times it continued to make my hair SUPER oily and greasy. I do not have oily or greasy hair normally either. I'm not happy and would not recommend this product to anyone because not only did it cost quite a bit for just shampoo (that now doesn't work) but I've had to like quadruple wash my hair and my hair color is washed out already. Rated 1 out of 5 by Kat24 from Oily right after rinsing I bought this product almost a month ago because my hair has started acting up and getting oily. I did some research and heard that this conditioner would help cut down on the oilyness of my hair. I've used it about three times and each time I've gotten the same result. I thought that maybe I was using it wrong but I did as the bottle said... it is a nightmare. Rated 1 out of 5 by kaykay69 from Ruin :) Dried out my hair a ton & made my hair feel crusty. It smells good tho. Rated 5 out of 5 by Kippany from Touchable soft hair My hairstylist recommend this product after I went back to a dark hair color after years of having bleach blonde highlights and I can't say enough about the way it makes my hair feel. Prior to using this my thin fine hair was feeling like straw at the ends but now it feels amazingly soft, looks healthy again and is so shiny. Makes my hair smell great too!